With recent changes to Google Chrome, many clients are asking why their website is showing as “Not Secure.” Google Chrome is now showing all websites, regardless of if they are selling merchandise on their website, as “not secure” if they do not have an SSL certificate installed on their site. An SSL or Secure Sockets Layer is the standard security technology for establishing an encrypted link between a browser and a web server. This secure link ensures that all data passed between the browser and web server remains private and integral. In other words, an SSL certificate is your electronic passward. If you don’t have the SSL certificate, a secure connection cannot be established, which means your business’ information will not be digitally connected to a cryptographic key. When you purchase a SSL certificate, your website and all of its links will change from HTTP to HTTPS. This will not effect an external links and all addresses will automatically be changed. In addition, your clients and potential customers may see additional assurances like a lock icon and/or green letters in the address bar. This indicates that your website is well-trusted and encryption is in use. Easy! Call your hosting provider and tell them you would like to purchase an SSL certificate. 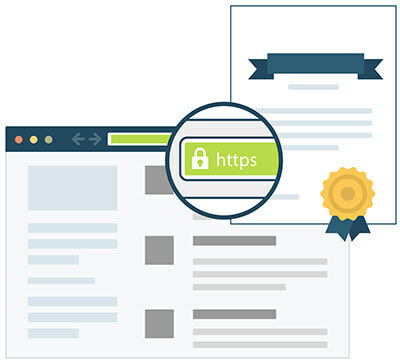 SSL certificates can range from $50 – $100 annually, depending on your hosting provider – and they can generally install it for you.